Upon arriving in Saffron City, you will come to find that Team Rocket has taken over the the Silph Co Building at the center of the town. 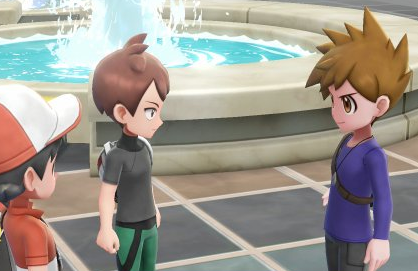 As you pursue Jessie and James into the building in hopes of stopping Team Rocket once and for all, you will be met by both your Rival and Blue. Blue will come up with the plan of you staying and defeating Team Rocket within Silph Co while he goes out into the Kanto Region to defeat anymore Team Rocket Members (as well as to notify the Elite Four on what's going on). After agreeing upon the plan, Blue will need to make sure you are up for the task. You will have to prove to him that you are indeed strong enough by defeating him in battle, and after doing so, he will depart with the plan now fully in motion.